Vermont is a small diocese, with many small congregations and many small church buildings. That means, of course, that we have many small sacristies. In fact, in some of our smallest sacristies there is hardly room for more than one person to work at a time. As you might expect, the challenges of these “tight” spaces have produced some humorous as well as tender moments. I recall one time when I accidently knocked over the stack that the altar guild member was preparing for the altar as I tried to “slip” past her with my vestments. We both had a good chuckle about “stepping on toes” in the maneuver we didn’t execute so well that morning, and then I got out of the way to let her do her work! As I have observed and made my way around these various smaller sacristies over the course of the past ten years, they have come to be something of a symbol for me about the importance of respecting one another and our differences by graciously making space for one another. The “dance” that takes place on a Sunday morning in some of these small sacristies just before worship begins is an expression for me of the gentle and generous way open to us for honoring one another and our differences in the church and beyond. Ultimately, the space several people might be trying to occupy on any given morning for a variety of reasons (in many small churches the sacristy is often a multipurpose room) belongs to none of us individually, but to us as community and, of course, in an even more profound way to God. Various people have various reasons for using the sacred space. In order that we might use it well in the service of the purpose for which it is intended, we need to understand and respect what each other is about in that space and yield from time to time in order for the other to function well. Sometimes we do that clumsily in the tight spaces of our sacristies, but I have never experienced a time when the other wasn’t grateful for my making space for them, or when I was not grateful for their making space for me. Letting go of our sense of control or resentment at the place of the other in “our room” is good practice for the larger enterprise of making space for one another in the more complex and often contentious aspects of our life as the church, whether at the local level or at any other. 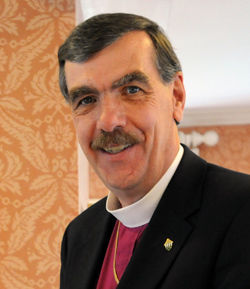 Over the course of the past eighteen months, my work as one of the three bishops on the Standing Commission on Liturgy and Music (SCLM) has included our response to Resolution C056 from the 2009 General Convention, calling upon the SCLM to gather and develop resources for the blessing of same gender relationships in preparation for General Convention 2012. This is obviously one of those areas in the life of our church where people have strong and differing convictions about what The Episcopal Church should be considering or authorizing. I’ve been part of the group working on the theological resources. Among other things, our process has included consultation with the House of Bishops, consultation with the International Anglican Liturgical Consultation and a gathering of nearly 200 General Convention Deputies representing almost every diocese in our church. As the SCLM prepares its final report for General Convention, I am mindful of the respectful and thoughtful way this work has been conducted and received by most everyone involved. Could it be that after 30+ years of struggle, conversation, debates and resolutions around the question of the full inclusion of gay and lesbian persons as members of our church that we have reached a point where we are prepared to more graciously make space for one another in the church we love so much? Ultimately, I don’t know the answer to that question, and I certainly don’t know fully what it will mean for each person to feel as though they are appropriately respected within the sacred space we call the Episcopal Church; however, I do hope that the answer to the question is yes. I suppose the answer will ultimately come by our living into the question and in the ways we demonstrate our willingness to make space for one another in what may well seem for many as a “tight space” challenging the “comfort zones” of any one of us. If I seem overly optimistic about our capacity to reach this place, perhaps it is because I have recently been reminded of the power of love in the face of challenge and even loss. Two of the smallest congregations in Vermont, with two of the smallest sacristies, were the churches hardest hit by the recent flooding from Tropical Storm Irene. However, those small congregations have members with large hearts and both are reaching out to their communities with compassion, even while they face the daunting prospect of the future of their own church buildings. Those are the generous hearts I find in the sacristies and sanctuaries throughout the Diocese of Vermont that continue to fill me with hope. Finding gentle and generous ways to honor one another and our differences in the church and beyond strikes me as a holy endeavor. The next time I find myself in one of those small sacristies in Vermont, I will remember to pray for all who engage this work of understanding, embracing, and honoring our differences and diversity. I invite you to do the same. It is indeed a sacred dance.